Home » Video Wall Display Installation Washington D.C.
Video wall solutions give businesses in and around Washington D.C. or Virginia the ability to display a message they want to convey to their patrons or employees with ease. Finding a professional video wall company with a proven track record of success with interactive video wall installations is important. They will know which televisions, computer monitors or projects to use for your vision. Screens that are specifically designed for use for a wall screen are necessary for this type of display. 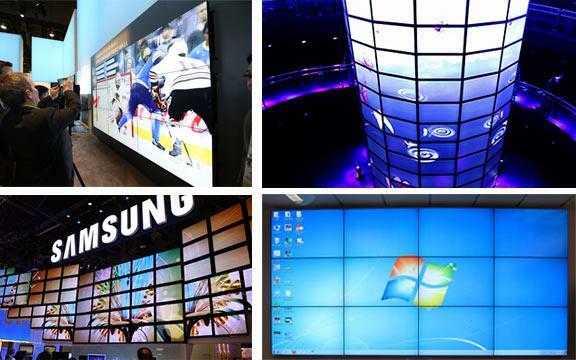 A company that specializes in video walls will know which LG, Sony or Samsung HD, LCD or LED screens to use for this process. Television screens that contain the hardware required to stack screens togethers must be used in order to adapt a successful video wall. Businesses use video walls instead of one single large screen because they want to be able to customize tile layouts throughout the year. These video wall display systems are often used in places where screens need to be seen both up close or at a distance or in long distances entirely. A video wall system doesn’t just have one use and can be customized for a variety of applications and nearly any business in any industry in Washington D.C. We can create any message with any design as we believe in satisfying our customer and helping their vision to become a reality. Capital Exhibits is a HD video walls installer who specializes in TV wall solutions. We have successfully created large display walls in colleges, universities, government offices, schools, hospitals, commercial buildings, shopping malls, convention halls, hotels, restaurant digital menu boards, trade shows, restaurants or airports. Our landscape or portrait video wall services can use single monitors or a large group of monitors to create a multiple TV wall in your business. Whether indoor or outdoor, our video wall mount installations are a great addition to your business. We can safely mount your HD, LED or LCD screens with ease. We can even customize a design that works best for your vision too whether 2 x 2, 3 x 2, 4 x 4 and more. Devise unique video walls with the help of our professional video wall installation team. We offer a crisp picture in a design that works best for your particular needs and message. Our multi-level, customized arrangements can be heightened with the help of custom audio options such as high-performance speaker systems. Essentially, we can add any elements that help make your content shine the way you want it to and to draw the attention to it that you crave.